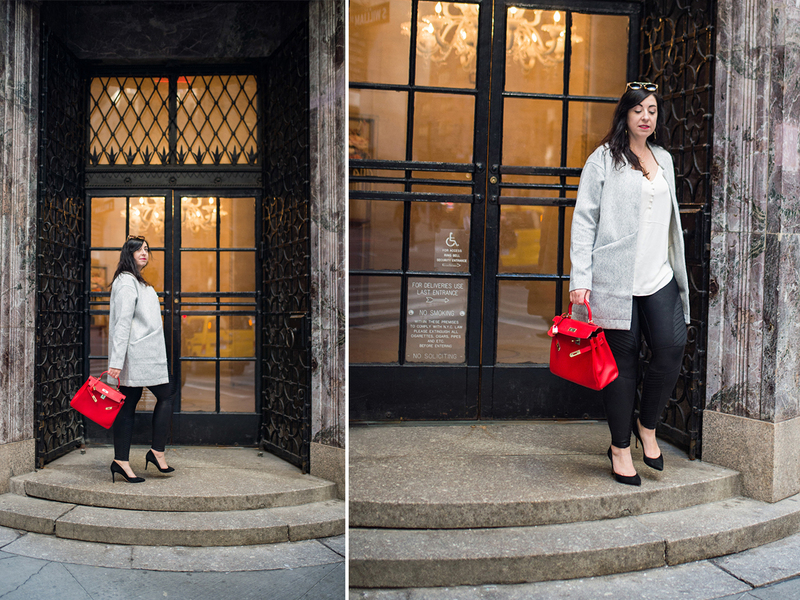 This outfit post about a warm Early Spring work outfit contains affiliate links. Please read this blog’s disclosure post for more info. 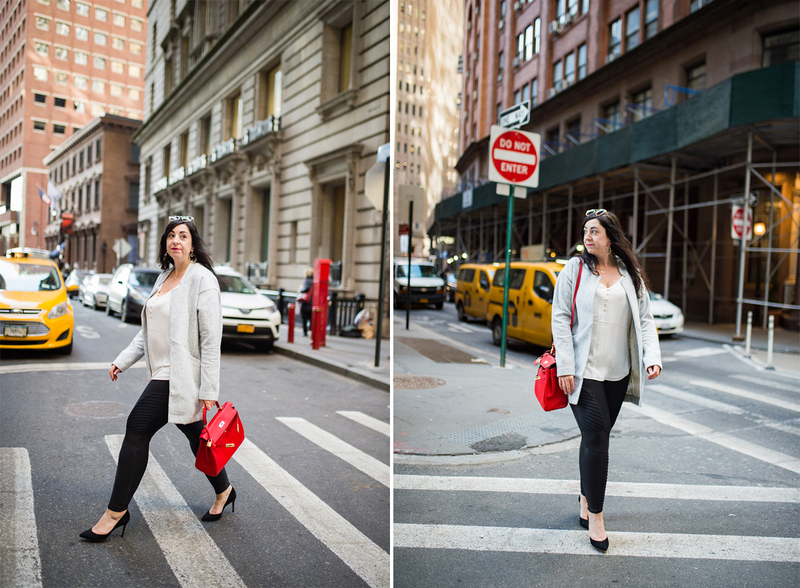 This week has totally flown by for me, like the wind sailing through my hair in downtown Manhattan. My work uniform may be black, white and grey. 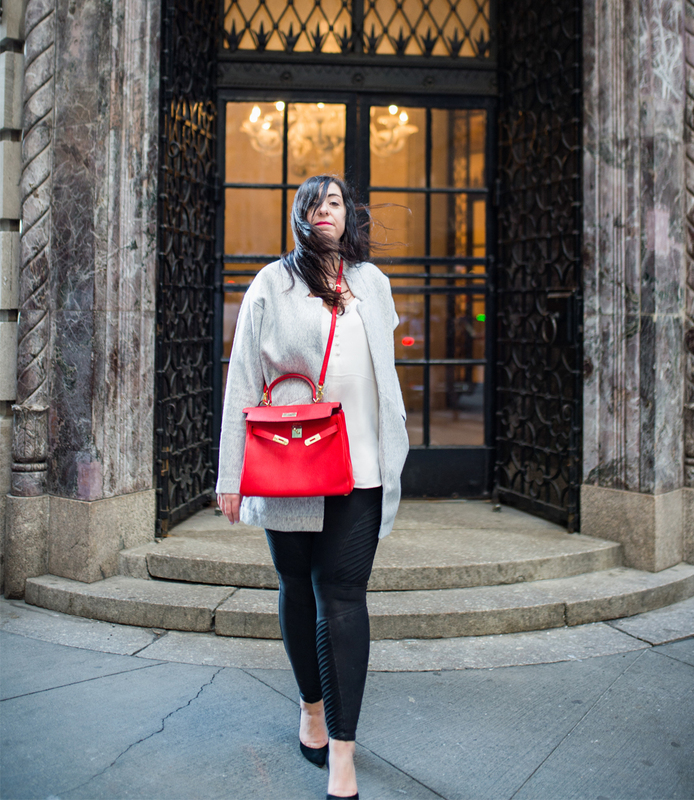 Yet a pop of red can instantly make an outfit feel Spring-ready, don’t you think? 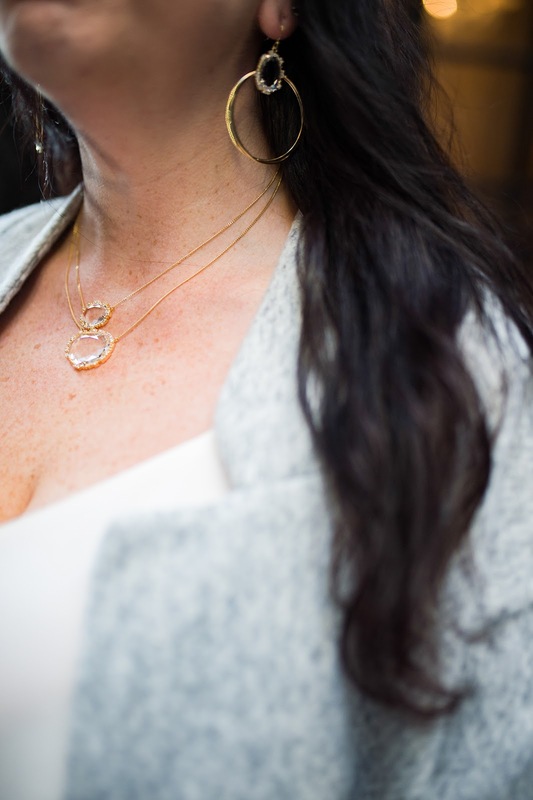 It’s the ideal finishing touch to a warm Early Spring work outfit. I’ve worked in a casual office environment the last few years. It’s so tempting to work in jeans everyday, and I do often. However there’s still something about dressing up a bit for work that makes me feel more professional. Perhaps it’s because I’ve achieved my dream of being higher up on the corporate food chain? I’m enjoying feeling like the world is my oyster and I’ve got the pearl. Also, dressing up is fun! Dress for the position you want, they used to say to me. From new admin assistant to creative minds to CEO, I see these Spanx Faux Leather Leggings on everyone. They’re versatile and quite the modern work pant. Conversely, few things are more classic than a white button-down and a cigarette coat. (So named because it was meant to be thrown on for 15-minute cigarette breaks back in the day — no time for buttons! Coffee coat might be more apropos these days.) For a warm Early Spring work outfit the mix of light and warm is perfect! I so adore my oversized coat here and I’ve mentioned it often because I love it so much! It’s big and comfy. It’s not the warmest coat ever. In fact its openness lets a lot of breeze in. That makes it good for warmer days to slightly chillier nights, but in the true cold you’ll need another heavy layer. Still, I’m sure I’ll get so much wear out of it that’s invaluable to me. Finally, there are my accessories. Oh, the red! This bag is a recent family gift to me that’s been passed down a couple of generations now. I’m honored to be the current caretaker of this Hermès Kelly. In my hunt for other designer dupes recently I came across this Amazon Fashion take on the bag, and it looks lovely too! Along with my Charlotte lipstick, it’s two beautiful pops of red that truly sing off my pale skin and dark hair. I can’t wait for warmer days, but in the meantime this will more than do. You may have noticed that multiple pieces in this look are available on Amazon Fashion. Earlier today I shared my picks from their current selection. Be sure to check that post out! And if you want to see more of my OOTDs, follow me on Instagram for the first looks and then check out my OOTD gallery here. You always have the cutest bags! Having one that's been passed down through family makes it even more special. Sundance has an extra 25% off outlet this weekend. Lots of really good stuff! Thanks Anthropolitan!! Ohhhh that is awesome! I'll have to take a peek, but probably won't have time to write a post. Oh wow!!!! Roxy love ur handbag😍😍 and that’s so cute how u got it. I love ur accessories too. Thank you so much Nam!! You're so sweet and I love how positive you always are. 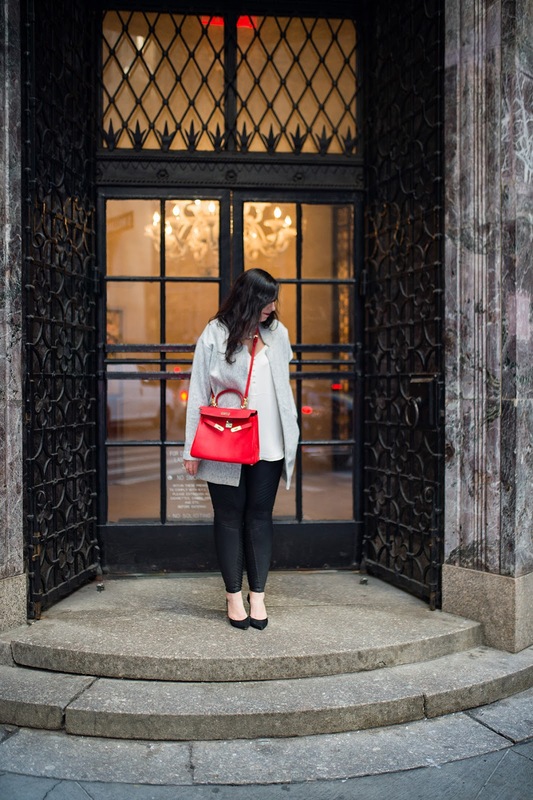 I’m loving these neutrals with the pop of red in the handbag. Perfect for work! What a cute and cozy outfit! I love the pop of red with it too! i've been eying those leggings! they are super cute i love the detail! i only wish i could wear them to my office!! I love them so much! I wear them several times each week. What a great outfit for work! 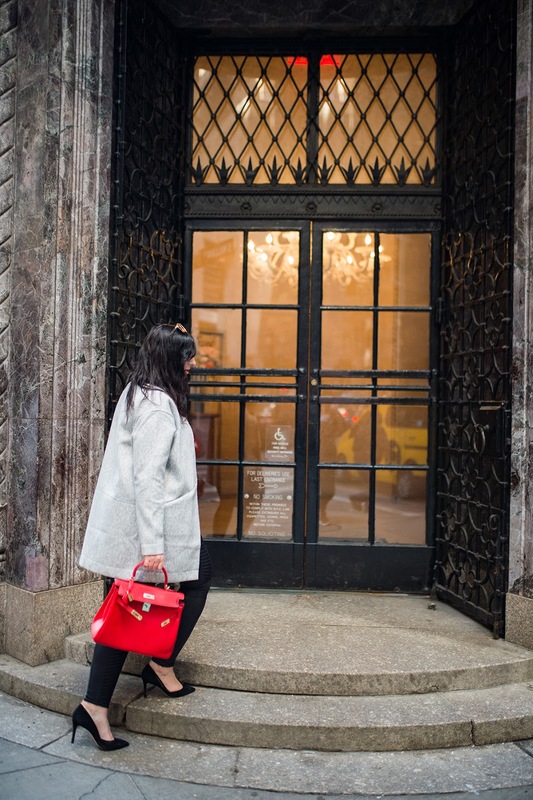 Love the coat and bright red bag. The bold red bag is beautiful!